Solar - Fonon Technologies Inc.
Fusion kits offer a fully integrated turnkey solar electricity system – ready for installation. ASP Fusion solar kits come complete with components that are specifically designed to fit together precisely. 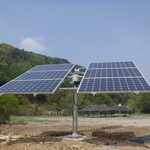 Available as 5 kW, 7.5 kW and 10 kW PV power equipment systems that are ideally suited for residential and commercial applications. They are pre-engineered to optimize system performance and meet applicable NEC codes and requirements. Kits come complete with installation, operation and maintenance manuals making it easy for licensed electricians and solar contractors. The American Private Power Plant (AP3™) is a turnkey distributed energy generation system that produces electricity at the point of consumption, minimizing line losses and maximizing energy efficiency. Made in America, the AP3 provides your company with freedom from electricity price increases, security of power supply and independence from the electric utility. The AP3 series is developed to be modular and scalable. By combining individual modules, any size system can be created for any application from 25 kW to 1 MW and beyond. Each module comes as a complete turnkey system with all necessary equipment and balance of system components. 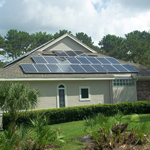 Our residential customers will benefit from visiting SunHouseSolar.com. There you will find a wealth of information on solar PV systems and how to turn your house into a SunHouse™ and reduce or eliminate your monthly electricity bill. Additionally, information on the 30% Federal Tax Credit, utility rebate programs and how solar electricity works in your home can be found. The SolarTower™ 1.5 kW solar trackers maximize solar tracking performance while reducing costs and operational risks for large commercial and utility scale solar power plants. Available in both dual- and single-axis, the systems contain simplified wiring, standard nut/bolt installation and can be assembled by a two-man crew. The available energy produced can be increased up to 37% over a conventional fixed-axis system.